Bodhi-Dharma was an Indian Buddhist monk who came to China (East land) from India (West land) in the first quarter of the sixth century. He brought Mahayana Buddhism to China. It is said that he was born as the third prince of a kingdom of south India. Coming to China, he stayed nine years at the Shao-lin Temple, located east of Luo-yang of He-nan Province. 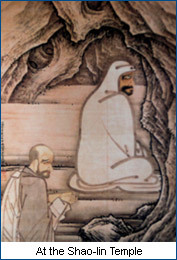 Bodhi-Dharma is well-known in connection to a story expressed by the phrase “Wall Contemplation Nine Years”. From the philosophy and practice represented by this phrase, the Chinese Zen Buddhism originated and developed in ensuing generations. The Bodhi-Dharma is respected as the First Zu (First patriarch). Zen Buddhism brought about revolutionary changes and enlightenment in the culture and lives of not only practitioners but also ordinary people in east Asia, including China, Japan, Korea, Vietnam and other countries. In our contemporary world, the influence of Zen Buddhism is not waning, but rather it is vigorously expanding worldwide, and its importance is increasing even more. 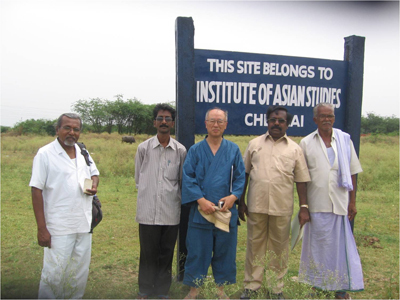 The Institute of Asian Studies in Chennai of South India is one of the premier research centres of international reputation actively engaged in the study of the homogeneity among the composite cultures of the people of Asia. Realizing the importance of Buddhism in the building up of close solidarity and friendly ties among the Asian countries, the Institute of Asian Studies has taken up such projects that aim at studying objectively the spread of Buddhism to various parts of Asia. One of the main projects in this line is to establish a Study Centre to commemorate the memory of Bodhi Dharma, one of the greatest Buddhist monks from India. The Institute of Asian Studies has purchased two acres of land in Kanchipuram, the birth place of Bodhi Dharma, to construct a monument, a Vihara of Buddhist monks and a Study Centre for Indian philosophy and Buddhism to be named after Nagarjuna, another Great monk from South India. According to historical documents of China, the name of the Kingdom is expressed with two Chinese characters 香至. No historical record says where the kingdom 香至 is located. At this time when interest in Zen Buddhism is increasing throughout the world, the birthplace of this pivotal master would be a great concern. The Chinese name 香至 means “fragrance extreme”. 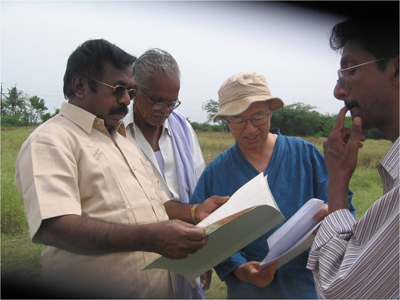 At the time of Tang dynasty (618-907) of China, it is likely that 香至 is pronounced as Kang-zhi, which happens to be close to Kanchi (-puram), an old capital town in the state Tamil-Nadu (the part ‘puram’ means a town or a state in the sense of earlier times). It was a capital of Pallava Dynasty at the time when Bodhi-Dharma was living. In view of these histories of Buddhism and its role in the modern world, it would be a project of great significance to construct Bodhi Dharma Center in Kanchipuram which sites a monument, a vihara, and an institute of Indian philosophy with a meditation hall. Once the Bodhi Dharma Center is founded in Kanchipuram, it could be a sacred spot not only for Buddhists of India, China, Japan, or east Asian countries, but also for world Buddhists as well. Furthermore it would be one of the centers for the study of Indian Philosophy and Mahayana Buddhism. For all people who visit there in future, it should be a place to have close acquaintance with Indian Philosophy and Mahayana Buddhism. The tentative cost of the project is expected to be around US$1,000,000 . With this spirit in mind, we appeal to those who are interested in this great project for their generous support of establishing the Bodhi Dharma Center (BDC) in Kanchipuram as early as possible. Contact Us Copyright © 2014 Institute of Asian Studies. All Rights Reserved.